My second trip to visit this lovely old wreck. Such a beautiful location. 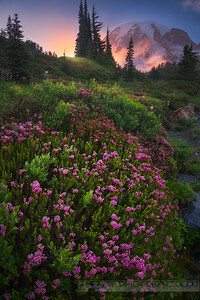 Heather is one of the many wildflowers to bloom in the spectacular Paradise area of Mount Rainier National Park in Washington State. 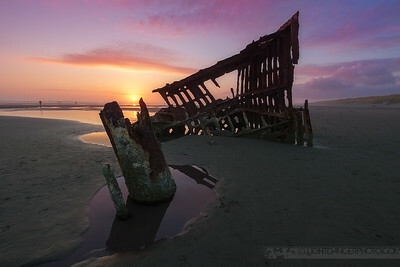 The Peter Iredale was a four-masted steel barque sailing ship that ran aground in 1906 on the shores of Oregon near Astoria on it's way to the Columbia River. The wreck is one of the most famous of what collectively has come to be known as the Graveyard of the Pacific. 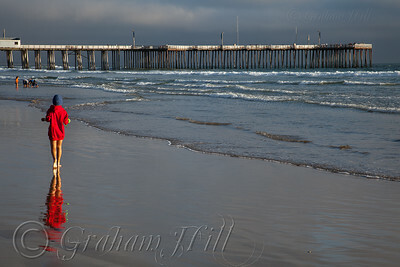 Strong side-light from the late afternoon sun highlighted the pier and the few beach goers willing to brave the cold water. 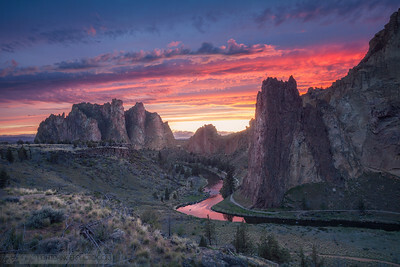 Out of the flatness of central Oregon rise these magnificent mountains known for their beauty and for rock climbing. In fact there were rock climbers of many different skill levels crawling all over these rock faces, including a tight-rope walker. 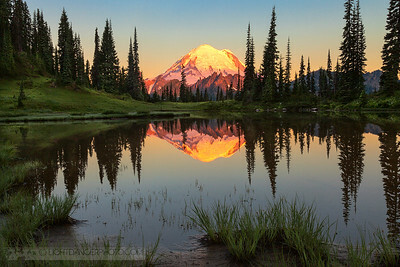 The mirror-like reflection of Mount Rainier just minutes before the sun rises. A thunderstorm was just clearing as I took this panoramic image. After a deafening thunderous clap above my head however, I decided it was time to pack up the big aluminum panoramic tripod. This photo was taken at the beginning of August and as you can see there is still a bit of snow left. 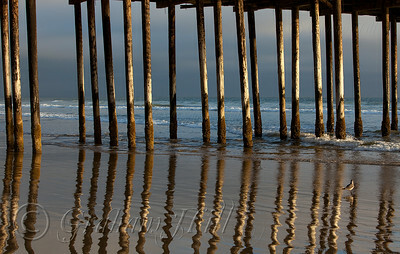 What to do when the light is flat and what you had planned on shooting isn't interesting? 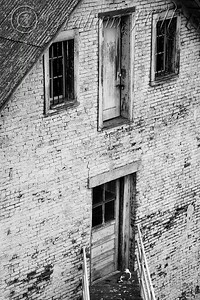 Change it up, look for something else, adapt... 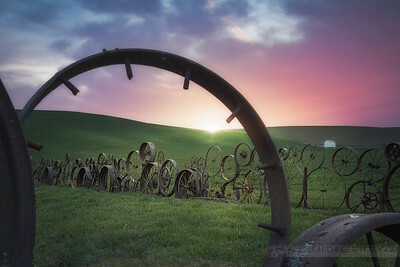 There was a lot of haze in the air when last I visited Steptoe Butte, so I started shooting some old apple trees near the park entrance - a special thanks to my wife for making me come across the road to shoot this one! 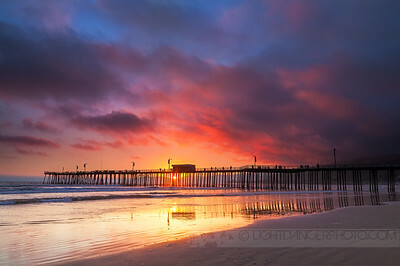 A fiery sunset lights up the sky and water by the pier at Pismo Beach in the summer. 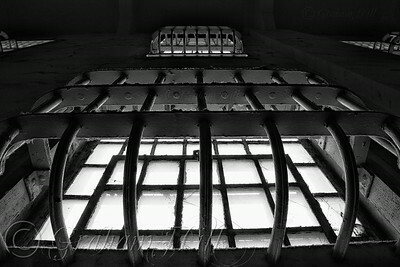 The barred windows in the prison on Alcatraz from the inside looking out. 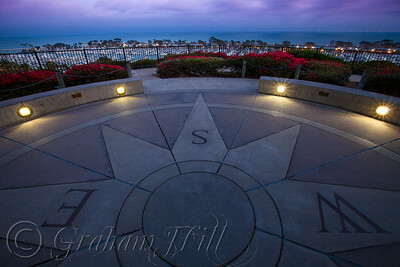 A lovely little park overlooking the idyllic marina of Dana Point on the California Coast. 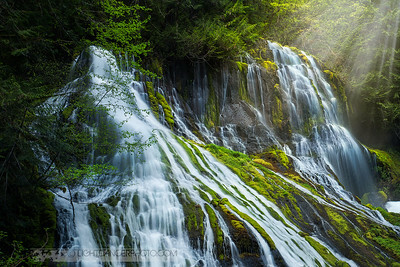 A much photographed location that I have always wanted to visit. 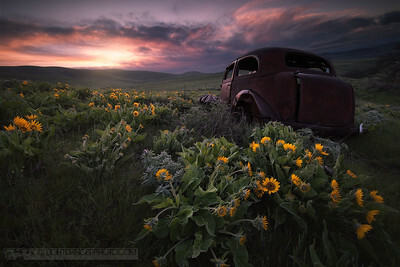 Unfortunately Spring came early this year and the Balsamroot was well past its prime, however the few flowers that were left for some reason seemed to be happiest closest to this old car. 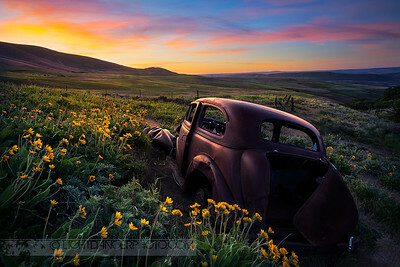 It was a fabulous, warm, calm morning - a rarity in the Gorge, and the light on this old car was delicious. 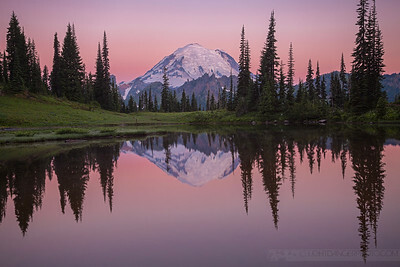 The mirror-like reflection of Mount Rainier from Upper Tipsoo Lake at dawn. It was a cold & very windy morning in the Gorge. We were up high enough with a view wide enough that we could detect the curvature of the earth with our eyes when looking down at the Columbia River. Low light levels and blowing flowers is always a difficult combination and necessitated using quite a high ISO. Hopefully my next camera will have a less noisy sensor. 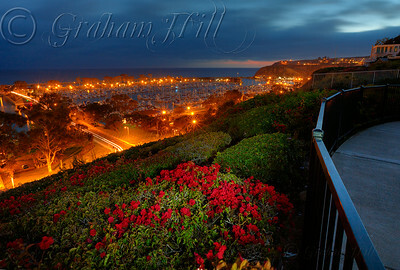 The view is from Heritage Park just after sunset with some light-painting of the foreground flowers. It was a very windy and misty location making a long exposure difficult; to top it off, the battery pack for my camera died. 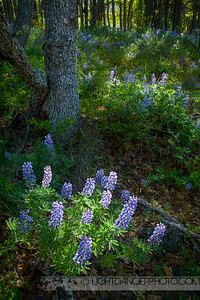 Lupin thrive amongst the shade of oak trees in Dalles Mountain Ranch on the Washington side of The Gorge. 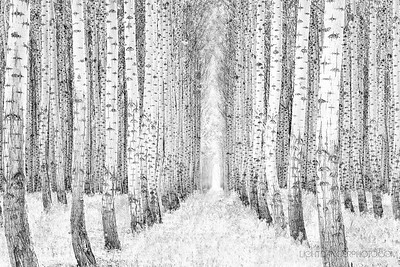 Forest scenes are always a challenge on a sunny day due to the uneven light, but sometimes it acts to focus your attention. 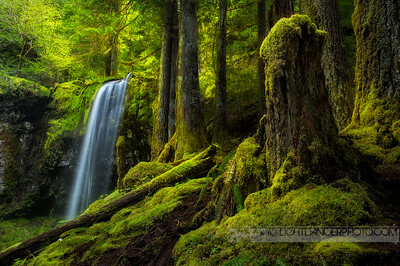 The light on the mossy stump was the inspiration for this photo. 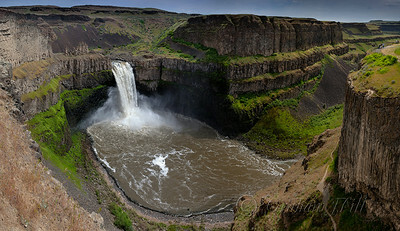 The Palouse river drops 198 meters at Palouse Falls into a steep-sided canyon. 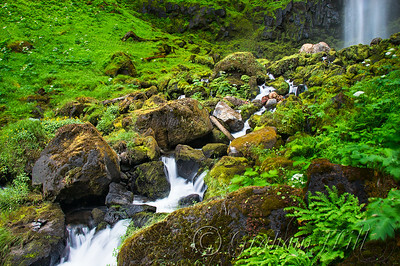 This photo was taken in Spring when river volumes were high. 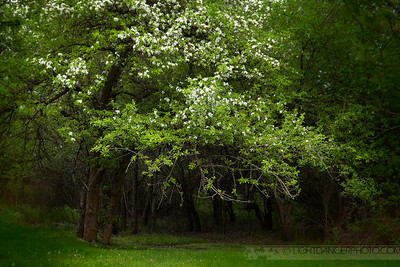 A tree farm located along I-84 in Oregon that I discovered on my drive from The Gorge to Palouse Falls. 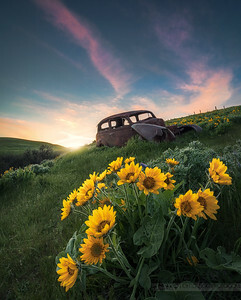 Visiting Steptoe Butte State Park just south of Spokane, Washington is a magical experience. 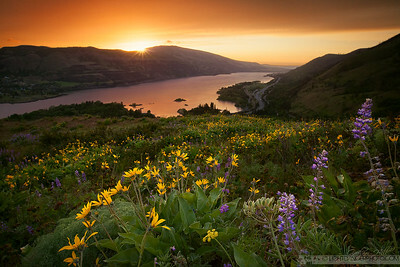 As the sun dipped toward the horizon, dozens of photographers positioned themselves for the show Mother Nature was about to put on. 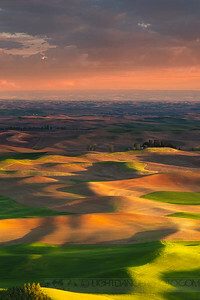 The rolling hills of freshly sprouting wheat fields come alive with the strong sidelight of a setting sun. 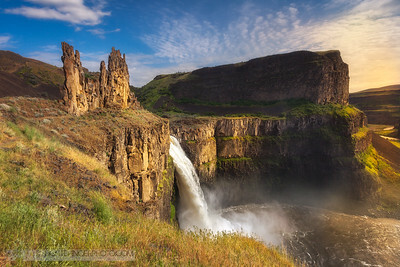 The lighting conditions changed rapidly as the sun began to set, so taking a large panorama was particularly challenging. 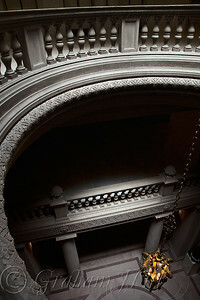 A location I am sure to revisit. 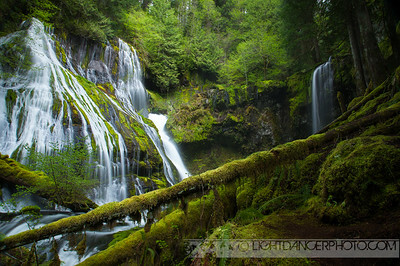 An easily accessible but well-hidden gem, Panther creek falls is a magical spiritual location that we were fortunate to have all to ourselves for a couple of hours.